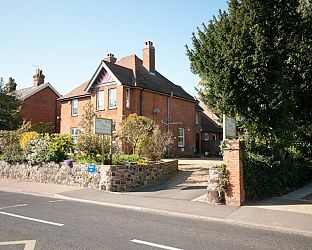 Home from Home is an established guesthouse, in a large Edwardian house, located in the popular town of Leiston, offering comfortable, friendly bed and breakfast accommodation whether you are on business or pleasure. We aim to provide a clean, warm and friendly atmosphere and give good value for money with a stay that is home from home. Visit Aldeburgh Suffolk and the surrounding villages and stay in b and b, hotel or holiday home accommodation provided by BedPosts members. The seaside town of Aldeburgh in Suffolk is renowned for its shingle beach where fresh fish is sold daily. Aldeburgh is a flourishing town with mixed architectural styles, which grew up after the prosperous medieval fishing and ship-building centre of Slaughden was destroyed by the sea in 1936. Slaughden was still prosperous when the Rev. George Crabbe lived and worked there at the beginning of the 19th century before writing “The Barough”, a collection of tales which was the inspiration for Benjamin Britten's opera “Peter Grimes” which is set in the village. Attractions: Yacht Club; Aldeburgh Festival of arts - created by Benjamin Britten; Moot Hall; Napoleonic period Martello tower; 4 metre sculpture - the Scallop; century-old annual carnival. The River Alde, its banks bright with small craft, cuts in close behind the yacht club and divides the mainland from a long, marshy spit. The river passes Orford Ness, with its unapproachable radar installations, and Havergate Island, nesting-place of the avocet, before joining the River Ore.
Two miles to the north, Thorpeness is a mock Tudor extravaganza with a water tower disguised as a house and known as “The House in the Clouds”. If you seek accommodation near Aldeburgh in Suffolk you have come to the website of a “club” of providers who offer affordable quality accommodation around UK in hotels, bed and breakfasts, guesthouses, inns, and restaurants plus self-catering cottages and apartments .